Preston University, Islamabad organized A Roundtable on “The Foreign Policy of Azerbaijan: Affecting Factors and Strategic Priorities,” was held at Islamabad Campus of Preston. 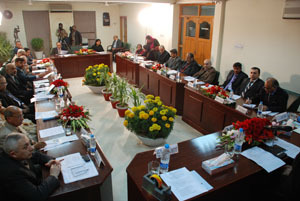 Eminent educationists and experts in international and regional affairs presented papers on the subject. H.E. Eynulla Madatli, Ambassador of Azerbaijan was the Chief Guest on the occasion. The honorable Ambassador of Jordan, H.E. Dr. Saleh Al-Jawarneh graced the event as the guest of honor.In his keynote address, as Chief Guest, the Ambassador of Azerbaijan,H.E. Eynulla Madatli highlighted various aspects of the foreign policy of Azerbaijan. Ambassador Madatli said on the occasion that Naghorno Karabagh is the biggest problem confronting Azerbaijan today, because Armenia has illegal occupation over Naghorno Karabagh. He said that Armenia has full backing of Russia vis-à-vis the issue in question. Ambassador Madatli further said that Azerbaijan had achieved significant landmarks under the outstanding and dynamic leadership of its great leader Heydar Aliyev, in a very short span of time. Azerbaijan’s national leader Heydar Aliyev enhanced state institutions, expanded the much needed foreign relations, realized a comprehensive energy strategy and laid the ground for country’s long-term perspective. Heydar Aliyev’s policy to strengthen Azerbaijani statehood is being successfully pursued by his successor, President Ilham Aliyev. In his brief remarks on the occasion, the Ambassador of Jordan, H.E. Dr. Saleh Al-Jawarneh said that unity among the Muslim countries is the need of the hour. Resolution of the Kashmir issue and Naghorno Karabagh lies in unity in the ranks of the Muslim world, he said. Earlier in his welcome address, Dr. Abdul Basit, Chancellor Preston University expressed his profound gratitude to the Chief Guest, Ambassador of Azerbaijan, H. E. Eynulla Madatli, Guest of Honor, Ambassador of Jordan, H. E. Dr. Saleh Al-Jawarneh and the distinguished speakers and the guests for their presence at the Roundtable. Speaking briefly on the subject, Dr. Basit emphasized that due to its strategic geographic location Azerbaijan enjoys a special place in the comity of world nations. He said that Pakistan has very strong friendly and brotherly relations with Azerbaijan. Efforts must be continued to be made to further consolidate this relationship in the years ahead. 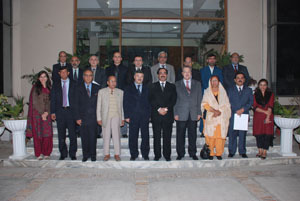 Other distinguished personalities who addressed the Roundtable, were Colonel Dashdamir Mammadov, Military Attache, Embassy of Azerbaijan; Mr. Vusal Suleymanov, third Secretary, Azerbaijan Embassy; H. E. Khalid Mehmood, former Ambassador of Pakistan; Prof. Dr. Ishtiaq Ahmed from Quaid-e-Azam University and Dr. Z. A. Qureshi, President Society of Asian Civilizatons, Pakistan. Later, Dr. Abdul Basit, Chancellor Preston University presented the university shield to the Chief Guest, H. E. Eynulla Madatli, Ambassador of Azerbaijan and the Guest of Honor, H. E. Dr. Saleh Al-Jawarneh, Ambassador of Jordan. Preston University shields and certificates were presented to the speakers and the participants by the Chief Guest and the Guest of Honor.